These are photos taken on Sunday 13th March 2011. 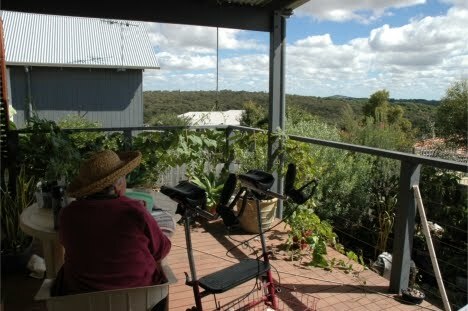 My Mother-in-Law on the back deck sorting seeds while we work in the garden below and watch how the new chicks interact with the Isa brown Penny. They certainly had some sort of social interaction for the day anyway. I wanted to put the half wine barrels on coaster wheels so I could move them a little more easily rather than just being stuck with where I filled them. 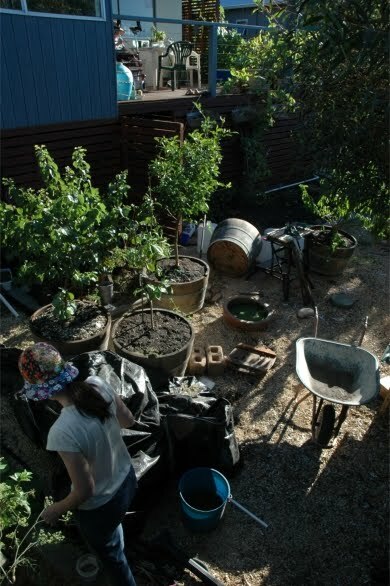 So most of the morning was spent re-potting the apricot, lime, lemon and nectarine and finding new spots for the frogs to live. 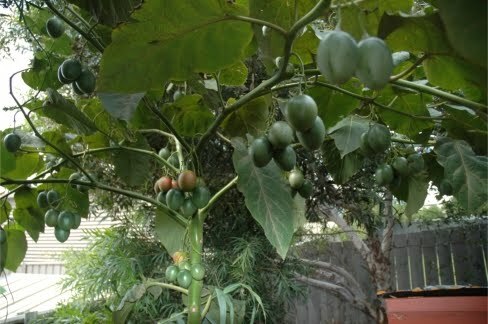 The photo below was taken today of my treasured tamarillo tree. It is heavily infested with aphids due to the hungry ants in the backyard but the fruit is holding and I’ve been keeping it steady with watering from the greywater. It is the best tamarillo tree I have grown and I’m thinking it is because I saved it from the pound (plant nursery) where it wasn’t looking very happy. It’s liked the attention and has grown over ten feet tall in twelve months and is producing a good lot of fruit. I am also very pleased to see that one of the babaco trees is flowering and although it has lost some as it has done each time, it is holding onto about three flower buds and they have grown and exceeded the size of the others that eventually the tree shed. So although I was going to re-pot and put them into a bigger pot I simply left it, top-dressed and mulched the pot a little more and gave them a good drink. They obviously like the spot they are in so I have left them there too in the little hot corner by the bedroom Hopefully I will have some photos of babaco fruit soon! And the pepino is going strong too. I accidentally cut two fruit from it over the working weekend while taking cuttings – they seem to be ripening still though so it will be interesting to see if they ripe ok. Meanwhile, I am striking other cuttings as they seem to root very, very easily at the moment. Literally overnight in some water and they are producing roots up to a centimetre long. These extra cuttings I plan to plant in other areas of the garden to really lush the place up and see where they will grow. 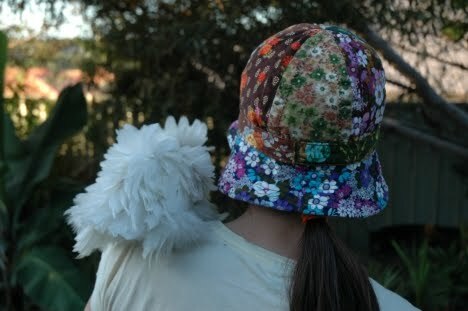 I am planning to try along by the chook yard as I suspect that the chickens won’t touch the leaves. They have ignored the sweet potato vine that has snaked its way up the wire fence and is now looking at attaching itself to the Tamarillo tree. Other exotic news. The banana is doing really well too. Just before Christmas it looked as they it had sent roots far enough to draw water from the kitchen sink drain. Having done so it has added a new leave probably each fortnight and has grown considerably in height. I also have to report that the choko vines have gone crazy with flowers. Flowers everywhere on them! The one on the side of the deck just has flowers dripping off it in the last week and a half. Tiny fruit are forming and I have added an upturned water cooler bottle by its base to drip feed it some water while its fruit swell. If the majority of these fruit do well we will be in good supply of chokoes for winter. The other surprise though is the other two chokoes that I planted at the base of two of the mallee trees. These have gone, well . . . feral, I guess. They have sent out vines throughout the trees, even into the highest branches. I was sitting in the house one afternoon not long ago and watching the tops of the trees sway and there sticking out from them looking for something further and longer to grow on was the grasping end of the choko vine. These vines also are laden with flowers at the moment. One is even making a dash for the tamarillo before the sweet potato gets there. After sorting out the pond and emptying some water out I discovered a couple of things. The smaller goldfish are doing well and some are starting to gold up underneath. One is already completely orange/yellow and has been for some weeks already. Greatly in advance of the others. When I moved a pot plant containing reeds I found two small yabby. Just over around 12mm. This is a good sign. I took it to mean that the yabbies are happy, surviving and that I will hopefully have some extra ones to put into the aquaponics set-up. Also, with the extra movement of water through the various pots the water chestnut have really thrived also. I moved several back into the pond now that the level was higher and it looks as though we will at least have some good stock for planting out for a crop next autumn. As also the madagascar beans that I bought at the organic shop. Just a couple in the bag and only one or two grew but they are doing well and still flowering. We will have some good seeds to sow for a crop in spring. The kitchen sink drain is doing really well and absolutely chock full of earthworms. More so it seems after I placed a broken down cardboard box into it and put a hessian bag across it. They love it. A few more things to report. This morning around 5am we had about 30 secs of very heavy rain. Then it stopped and the rest of the day was very hot and humid. The washing does not take long to dry in this weather. A couple of mornings I have also heard a boo-book owl calling down in the valley somewhere. Such a nice, distant call to hear in the early hours of the morning. I am also hoping to we will soon hear the call of the Lee’s Frogs in the garden – if they haven’t been disturbed too much over the last eight or so months. I do hope they return this year. They garden is so much more frog friendly now. So, the fruit trees have been re-potted, the strawberries removed from them and put into their own pots. The passionfruit trellis is finished finally and the vine is already filling out and looking at wandering further afield. The space under the deck is coming along and the side is looking much neater and ready for the aquaponics system. Yeah! Everything seems to be doing rather well. Bush beans and peas have been planted. Sweet peas planted. Garlic and shallots planted out. Spinach planted. Some potatoes planted. I am saving the rest to add to a vertical potato garden during winter. 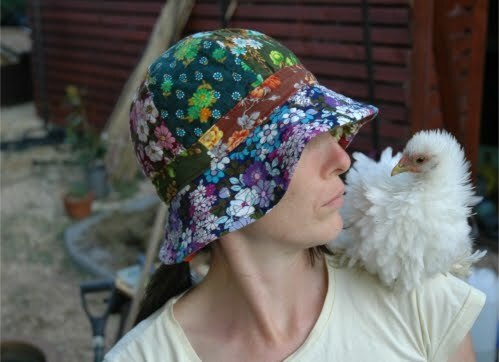 For yummy spuds and awesome compost. We do have some very happy mice under the house but I suspect once I find the trap they will move on. The passionfruit is having another flowering bout. Brussel sprout seeds planted. I think that is a decent catch up on things at the moment.